Young footballers are being given a wonderful chance to showcase their talents and make crucial progress as players through UEFA’s international development tournaments. As part of UEFA’s ongoing efforts to develop football across Europe, and in response to feedback received from the UEFA member associations, UEFA has set up the development tournaments to offer young footballing talents an additional opportunity to play competitive international matches. Following a pilot phase in 2012, the tournament programme has moved into full swing, with boys’ and girls’ events staged across Europe. The U16 age category has been selected, as UEFA believes this to be a crucial stage in a player’s development pathway to the elite level. Such friendly matches, as well as the preparation they involve, are key in facilitating the process of player development. 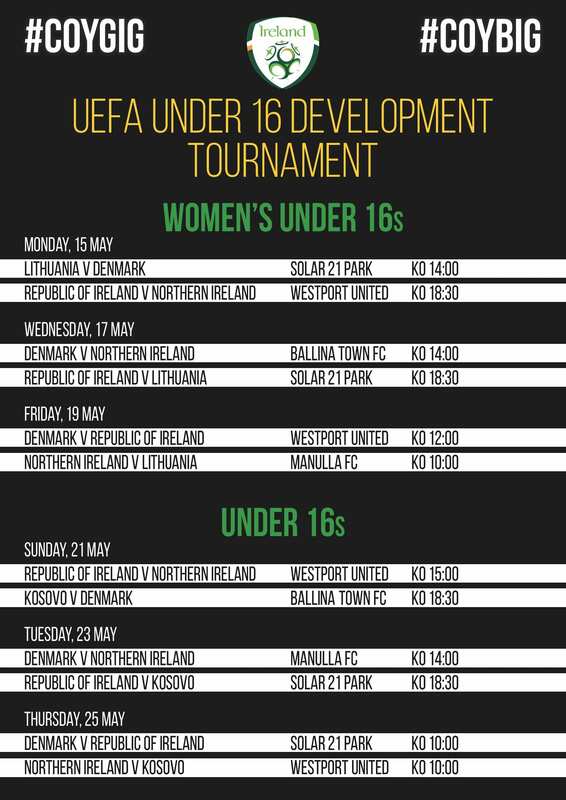 And Ballina Town Football Club are delighted to be hosting two UEFA Under 16 Development games, during the overall tournament in Mayo; Women’s Under 16 Denmark V N Ireland on 17th May at 2pm and Boys Under 16 Kosovo V Denmark 21st May at 6.30pm. Lets put Ballina on the map and give a warm Irish Welcome to our visitors from Denmark, Northern Ireland, and Kosovo. All are invited to enjoy these great sporting events at Ballina Town Football pitch.